Have you heard this scenario before? Could this happen at your facility? This example demonstrates the downstream effect and importance of a pump safety program. Before implementing a pump safety program at your location, it is important to know the risks associated with the type of repair work your facility undertakes and determine how those risks affect your business. If you do not consider the safety side of your procedures for teardown, service and repair, and transporting the equipment, you are increasing potential hazards and putting your employees at risk. This article will explore in four steps how a pump safety program can work to assist your facility in meeting goals of productivity and employee safety. Consider the scope of work when your facility encounters routine and nonroutine repair jobs. Understanding the repair or maintenance expectations is the key to success. Ask the right questions to determine your course of action—you cannot plan for what you do not know. For instance, is your facility trained and certified to handle hazardous materials (HazMat)? Do you have disposal procedures for all waste generated at the facility? 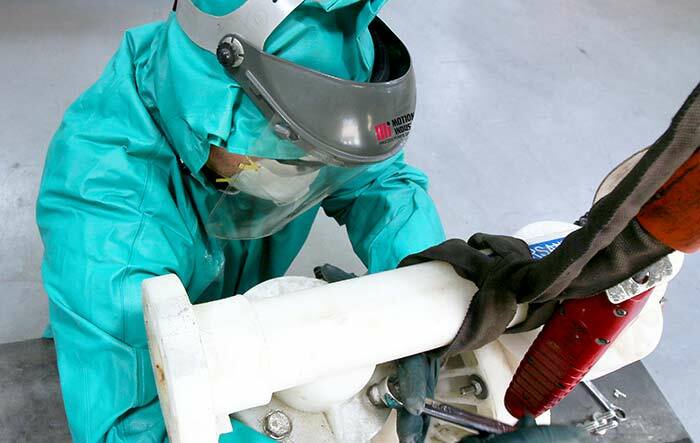 Are employees trained on how and when to use proper personal protective equipment (PPE)? Do your facility transport vehicles require signage? Image 2. Using an overhead crane hoist, the service technician removes the air-operated double diaphragm (AODD) pump’s manifold during a teardown for repair. A pumping system includes more than pumps; it includes everything from pipes, hoses, fittings and valves to hydraulic pumps and transfer pumps. 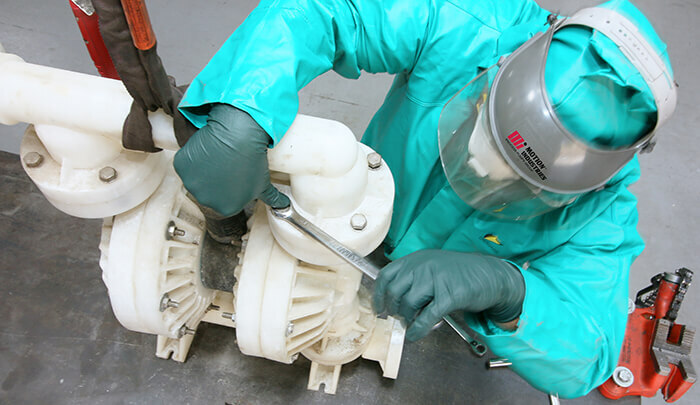 When following a pump safety program, the first step is to determine if the parts presented for repair were exposed to a chemical, a food process or contaminant. As a best practice, determine if the parts presented for repair have the ability to trap or store these items inside of the equipment. The second step of the identification process involves the evaluation of personnel, equipment and chemicals that will be necessary to complete the job. The evaluation process will ensure that the right talent is being used to complete the repair using the right equipment, and that the required safety equipment is used when handling chemicals. The last step in this process is to determine what transportation requirements will be involved for the repaired part. The method of transportation and delivery is a critical and often overlooked factor. When a company vehicle is used as the method of transportation, the driver must be aware of all potential hazards and risks involved in the transport of the equipment as well as how to get help in the event of an accident or emergency. Likewise, if the repaired part is shipped from the facility, the location assumes liability for the hazardous material(s) that may be found inside of the equipment. Image 3. A service technician removes an AODD’s manifold bolts while suited up. The chemical within the pump was nontoxic/noncorrosive but as a precaution, he is wearing full PPE. Often, the need for answers can lead to the implementation of a process. Whether the hazards are external, internal, or both, a process pump safety program can be designed to outline and communicate the risk associated with the hazard at all levels, so that sufficient oversight and sustainability can be provided. These basic questions can serve as a starting point. What is the application of the process pump? Has the equipment been properly drained? Has the equipment been cleaned or neutralized from hazardous chemicals? Has a copy of the SDS for chemical(s) used within the equipment been provided? Once you have identified pertinent questions, consider the external and internal risk that could be a factor and drive the design of a written procedure and documents. External Risk: The customer reports that “only” water was being pumped through the part being repaired when, in fact, the water contained diluted 5 percent hydrochloric acid. Internal Risk: Your repair facility lacks or fails to use adequate safety equipment, allows complacent behavior to exist that allows leads one to act in an unsafe manner, or ships an undeclared HazMat such as xylene trapped in the veins of a pump (see documentation example in Image 3). With the design of any safety system, the process must allow for a review of the changes implemented, documentation of any ongoing changes and the use of a corrective action plan when events inside the process are opposite of an expected outcome. Following these steps to develop and implement an effective pump safety program can help protect your employees and your business from costly accidents. Engage a qualified safety expert as you begin to evaluate your pump safety program to ensure its success. LaQuita Donald, CHMM, CDGP is the the environmental and hazardous materials compliance manager at Motion Industries and has worked in the hazardous material profession for 25 years. Tavis McVey has worked in the process pumps industry for six years with Motion Industries. He is a graphic and communications manager with a focus on technical product marketing. For more information, visit www.motionindustries.com/pumpsandsystems.